With a need to strike the right balance between traditional retail requirements and the ever-evolving e-commerce trends, retailers are quickly adopting innovative technologies, with mobility being the major one. Careful planning, execution, and device management are the vital cornerstones of a successful mobile strategy for any retailer, serving dual purpose—for both employees and customers—who consider mobile devices as a part of their daily lives. An effective mobile strategy saves time by providing customers with immediate access to product information, documents, and presentations. Importantly, these smart technologies facilitate quicker checkout, and help retailers with an easy way to send coupons and loyalty points, and provide immediate discounts at checkout. Due its portability and convenience, mobile technology also helps connecting the employees to improve the efficiency of core business processes. 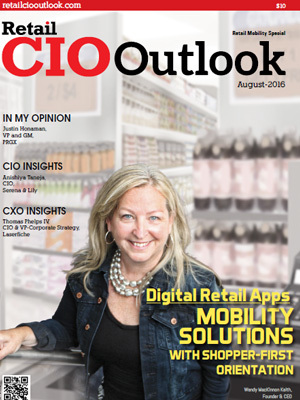 To help retailers find the best-of-breed mobility solutions that suit their business needs, in this issue of Retail CIO Outlook, we present the TOP 10 Retail Mobility Solution Providers - 2016, featuring the best vendors offering technologies and services that aid retailers in their business processes. The firms featured in this issue have exhibited vast knowledge and in-depth expertise in delivering retail mobility solutions. 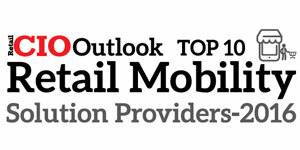 A distinguished panel comprising of CTOs, CIOs, analysts, and the Retail CIO Outlook's editorial board has selected the top players from the competitive field of retail mobility solutions. The listing provides a look into how these solutions work in the real world, so that you can gain a comprehensive understanding of what technologies are available, which are right for you, and how they shape in against the competition.